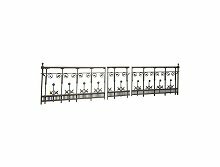 A stunning set of gothic or aesthetic cast iron railings or balconies in the style of Thomas Jeckyll with circular hand rails and stylised Sunflowers and leaf details. There are two identical longer lengths with ball finials and a smaller piece which could be made into a gate or kept as a return which is how it was originally made to be. The two longer pieces have female circular connections to the tops of each where the ball finials are (that I have shown in the images), and further pin connections running down from the finials to connect the pieces together. The three pieces could be made as one length, or a U shape, or a zig-zag shape (not shown), or any combination of the above with some slight modifications. Measurements Two railings height 43 3/4"; Length 68.3/4". The small piece measures: Height 39 1/2" x Length 29 1/4". The circular hand rail is 1 3/4" thick (with sweet detail supports just below). 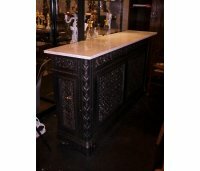 A set of five fantastic cast iron radiator covers made by The Liverpool and Macclesfield Cast Iron Co in the 1860's. These covers were originally made for The Royal Liverpool School of Music. One cover with a marble top (shown but the marble has been sold with another 1) has been fully restored, which consisted of shot blasting, priming and painting, the other 4 have been stripped and are ready to be painted to one's personal taste. Measurements without marble top Height 35", Depth 15 1/2", Width 64". There is an identical radiator cover in Sudley House Museum in Liverpool. Dr C Dresser. 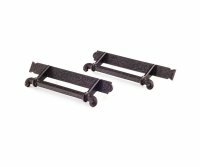 A superb quality pair of cast iron door handles made by Kenrick and Sons Iron Works. Height 13 1/2", Width 1 1/2", Depth 2 1/1", Bolt length 2 1/2". 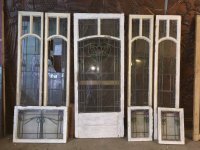 An exceptional set of 23 Arts and Crafts doors attributed to M H Baillie Scott with wonderful Glasgow style stain glass panels. The doors are made from slow growing scotch pine and something to behold when viewed in person. The stain glass panels were probably made by McCullock and Co of Glasgow. 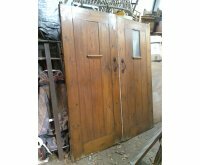 The quality of these doors are exceptional, a little thicker than usual doors. As well as the 4 large doors shown here in 9 of the images, there are 17 standard size internal and external doors, these 17 do not have stain glass panels but many have a single upper central glass pane, as shown in the last image but they could have stain glass made for them to match. Four are are painted white and one is a staircase cupboard door with a triangle cut to the top (not shown). You could build a house around these doors. Total height of doors with iron wheel extensions height 97 3/4 or 248 cm Width 35 1/2”or 90 cm x 2. Thickness 2 1/4" or 6cm. Smaller internal doors some differ slightly in measurements. Height 74” or 188 cm Width 33” or 84 cm Thickness 1 3/4” or 4 cm. 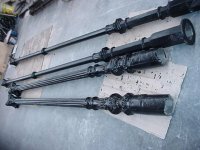 Four x Architectural decorative cast iron posts (two pairs) which have been shotblasted and professionally painted black ready to erect. A set of stained glass doors and windows, riddled with intricate floral detailing. 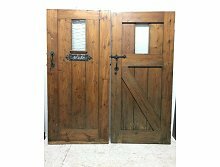 Door- height 80", Width 32"
Four side panels- height 80", width 22"
Height of large window which would go above the door- 22", width 32"
Height of the two small windows which would go above side panels- 26", width 22". Stained glass window with vibrant red rose focal point. A pair of stained glass windows depicting a little cottage on a hill with a smoking chimney amongst country scenery. A period Arts and Crafts stained glass door with stylised floral details retaining it’s original handle. 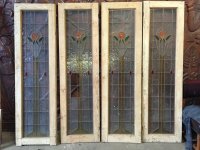 We did not fit all the stain glass panels for the images and for transport but we do have them and they are all in A1 condition. Glasgow School. Stained glass in copper, with stylised roses. Copper making it considerably stronger than lead; quite rare and very expensive in its day. Each door/panel measures- height 81", width 22 3/4". 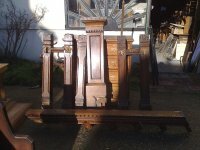 A set of good Gothic Revival oak inlaid stair posts consisting of one very large one, five smaller ones and a single stair support. 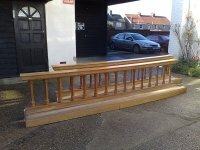 A pair of curved oak alter kneelers could be used for a number of things with an inventive imagination.